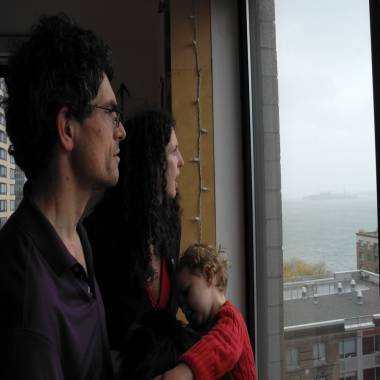 For some New York families who defied the mandatory order to evacuate for Hurricane Sandy, staying behind posed few problems for them though one did get a front-row seat on the storm as it touched down in the city. Two families profiled by NBC News ahead of Sandy’s arrival in New York on Monday night said they had power and water throughout the storm and afterward. “If we hadn’t been looking out the windows or paying attention to news we never would have known anything had happened frankly,” said Nicholas Rennie, a 45-year-old literature professor who hunkered down with his wife, Claire Wladis, 34, and their 21-month-old-daughter, Iliana, in their 15th floor flat in lower Manhattan. For others, the impact of the storm was without parallel in the densely populated tristate region of New York, New Jersey and Connecticut, with its destructive winds, heavy flooding and raging fires. Farther afield, powerful gusts felled trees and knocked out power for up to 8.2 million residents across the eastern United States, while heavy snow made travel treacherous at higher elevations. Nationwide, at least 46 were confirmed dead of storm-related causes. New York City Mayor Michael Bloomberg had ordered some 375,000 people living in low-lying areas to evacuate, though it was clear that many residents, like the Rennie-Wladis family, decided to stay put and take their chances. The family watched the surge of water creep up to their building, but from the east not the nearby Hudson River just to their west. It “looked like a pretty fast river moving north,” Rennie said late Tuesday, adding that the water eventually receded. They also saw the storm moving across New Jersey. The only major inconvenience was their building turning off the elevators pre-emptively. “We never imagined it would be for us such a non-event. We thought it would be much more dramatic,” he said, noting they were saddened by the misfortune of others who were more impacted by the storm. Some politicians had taken a harsh tone in criticizing those who stayed behind. New Jersey Gov. Chris Christie on Monday called residents who did not follow evacuation orders in his state “both stupid and selfish.” Bloomberg took a milder tack on Sunday, asking city dwellers to leave if ordered to do so as not to endanger rescue workers. For the other couple, Annie Chambliss and Laz Benitez, one of the few inconveniences they reported was losing phone connectivity. Getting a clear phone signal in some parts of the tristate has been difficult after the storm. “I don’t want to convey any sense of satisfaction about this except just relief on our own behalf,” he said, adding that their “hearts really go out to” the storm victims.